How often have you heard the phrase “It’s not what you say it’s the way that you say it”? While the tone of voice and body language are important and can enhance your message, never forget that the real message lies in the words that you use. If you have any doubts about this, consider your favourite TV programme. Would you still know what was happening if the sound was turned off? You might get an inkling from the facial expressions and gestures, so there is some truth in “it’s the way that you say it”. Now consider listening to your favourite radio show with the sound off! I think you will agree that the words are quite important. 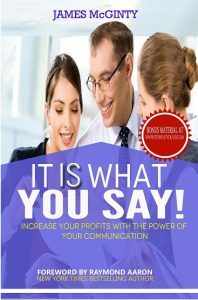 In my book “It IS what you say”, I address all aspects of communication and my YouTube channel is growing to include a precise of every section of that book.